"The location is very good for a tourist like us." Have a question for Blue Velvet Hotel & Cafe? "There are lots of restaurant, fast food chain and convenient stores nearby." 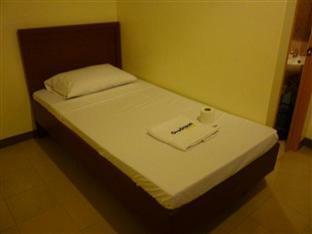 "The hotel is clean and quiet, the aircon is very good and the beddings are clean." "Beds are comfy, AC is working, place is clean and staff are..."
Well-placed in the shopping, restaurants, sightseeing area of Davao City city, Blue Velvet Hotel & Cafe provides a most conducive spot for you to take a break from your busy days. From here, guests can enjoy easy access to all that the lively city has to offer. This modern hotel is in the vicinity of popular city attractions such as San Pedro Cathedral, CM Recto Avenue, Osmena Park. Blue Velvet Hotel & Cafe offers impeccable service and all the essential amenities to invigorate travelers. Top features of the hotel include 24-hour room service, 24-hour front desk, luggage storage, Wi-Fi in public areas, room service. Experience high quality room facilities during your stay here. Some rooms include towels, non smoking rooms, air conditioning, television, satellite/cable TV, provided to help guests recharge after a long day. The hotel offers fantastic facilities, including spa, massage, to help you unwind after an action-packed day in the city. Enjoy unparalleled services and a truly prestigious address at the Blue Velvet Hotel & Cafe. Please be advised about the no-smoking ordinance in Davao City. As per the city government’s announcement: The no smoking ordinance prohibits smoking of any tobacco product including e-cigarettes, shishas and the like, in all accommodation and entertainment establishments, workplaces, enclosed public places, partially enclosed public places, public buildings, public outdoor spaces and all public conveyances, government-owned vehicles and other means of public transport within the territorial jurisdiction of Davao City (Ordinance No. 0367-12). Good location with good service. Friendly staffs with good breakfast. I really like the location because it is situated at the heart of the city and very accessible to the different spots. Cafe staff not courteous. Does not know how to greet guests. But I'm giving 3 stars only because the aircon it was too noisy, but the location and rooms are okey. Pros: -Accessible location. You can ride a jeepney in front of the hotel going to sasa wharf to samal. One ride to gmall, sm lanang, abreeza and robinsons. -Near San Pedro Cathedral, osmena park, d' bone collector museum, roxas market, peoples park, museo dabawenyo, city hall and freedom park (walking distance lang) or ride padyak or tricycle. - near bpi and bdo -restaurants everywhere -Clean room -free glutatione soap hahaha -free breakfast (but we failed to avail it) CONS -Noisy aircon -no elevator - hotel starts at the 3rd floor of the bldg. -not soundproof wall -broken deadlock -no hanger or any place to hang the towels. We are happy that we choose Blue velvet hotel, you don't need to have a tour guide for city tour you can do that alone.... Don't miss to go to Museo near at city hall and the D'Bone we enjoy and learn the history of Davao, the Hotel is also near in Samal Port. Samal experience is so fun and the beach is beautiful like Boracay white beach I suggest you stay there Friday to Sunday they have party and Fire Dance every Saturday Night. The location is very good for a tourist like us. It is near to the tourist spots like the people's park, museo dabawenyo, d' bone collector museum, churches, pasalubong centers and a lot more. There are lots of restaurant, fast food chain and convenient stores nearby. 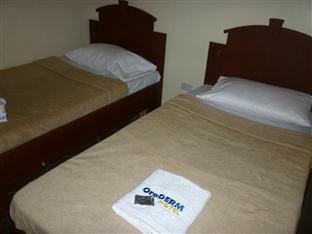 The hotel is clean and quiet, the aircon is very good and the beddings are clean. The space of the room is quite small but if you just stay there to sleep at night there would be no problem at all. The restroom is okay but there are no pail and dipper and a bidet but the hot and cold shower is very good also. There are no toiletries available in the unit, only bath towel and a little soap are there. So, i advise you to bring your own toiletries if you plan to check in here. 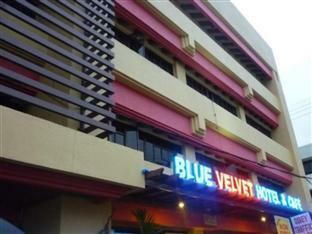 But over all, Blue Velvet Hotel & Cafe is very practical place to stay because of its low cost offers. Compared with the room charge, the cost performance is best. Food was good. Room was clean. It was a bit small but it was okay. They had hot and cold shower but there was no bidet in our bathroom so we had to improvise :-D The location was GREAT. Our room has no windows, maybe because it was the room assigned to Agoda and it has a little discount, but other than it's ok. Beds are comfy, AC is working, place is clean and staff are friendly too. Walking distance from the city. I would recommend this if you are just planning to sleep in the hotel or spend little time there and explore Davao the whole day. We booked an Agoda promo I think so the room does not have windows. We didn't mind because we only stayed in the hotel to sleep. Room is basic but clean (ok for bed, AC, restroom) and the location is at the heart of the city. Staff is friendly too. Air condition unit is not cooling and suffocating because no windows are available even in hallways. It can kill you if you stay 24hrs in tge room.